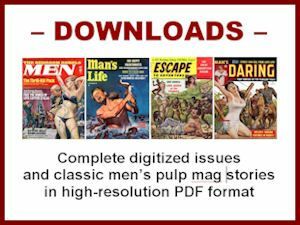 Yes, I know, given the woman’s head on the stick on the cover of the February 1958 issue of For Men Only magazine (shown at left), the title I used for this post is a terrible, tasteless pun. But I happen to like terrible, tasteless puns — and pulp art with heads on sticks. 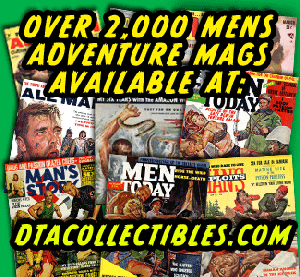 And, aside from having a wild example of the latter (by an uncredited artist), there are a couple of full-page ads in this issue of For Men Only that show how men’s adventure magazines actually did help some men get ahead in life. 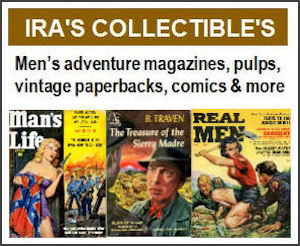 Many of the World War II veterans who were a key target audience for men’s pulp mags had limited educations. That often made it difficult for them to get a good-paying job in postwar America. 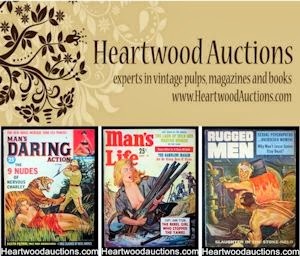 If you read vintage men’s adventure magazines, you can’t miss the ubiquitous presence of ads for correspondence schools and other services and products that offered to help those men improve their lot in life. There are two interesting examples in the February 1958 issue of For Men Only. One is an ad for the venerable International Correspondence Schools – which still exists and was essentially the forerunner of the online universities and courses of today. Like many ads for job training schools and services in Fifties men’s magazines, the ICS ad subtly played on — and cleverly addressed — the sense of educational and social inferiority some vets struggled with. All of us can’t be geniuses. But any ordinarily talented mortal can be a success – and that’s more than some geniuses are. Now, as in Aesop’s time, the race doesn’t always go to the one who potentially is the swiftest. The trained man has no trouble in passing the genius who hasn’t improved his talents. In good times and bad times, in every technical and business field, the trained man is worth a dozen untrained ones, no matter how gifted. In other words, screw those so-called and self-proclaimed “geniuses.” If you get the right training and work hard to learn a trade and improve yourself, you can get a better job and make more money than most of those a-holes. I gotta say, based on my own experience in life at age 60, that basic concept still rings true to me. A “genius” IQ plus a few bucks will get you a Caffè Latte at Starbucks. In addition to career training, many ads in vintage men’s adventure magazines offered to help men get ahead by improving their language skills. Of course, the true target for that ad was men who really didn’t have a good education. But it protected their egos by suggesting that they’d benefit from the course even if they had a PhD. A little interesting bit of trivia about Sherwin Cody is that he was (he claimed) the cousin of “Buffalo Bill” Cody. The Editorial Director was Noah Sarlat. 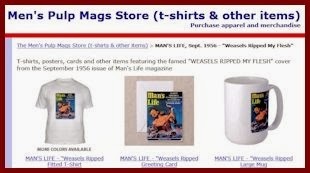 Like his colleague Bruce Jay Friedman (father of Josh Alan Friedman, who was featured in my previous post), Sarlat served on the editorial staff of several of Martin Goodman’s Magazine Management publications, including Stag, Male and For Men Only.